Look, let's get something straight. I'm a real man, and real men can admit their fears... of greek yogurt.... Sorry, couldn't resist, but all kidding aside, it's true. I'm not a huge lover of yogurt by any means. Sure I downed some smurf yogurt as a kid, but nowadays I have an occasional berry flavored Yoplait and not much else. Yogurt just seems weird to me. You open it up and you've got these weird white clumps and puddles of water and oh I just want to go blech. Yes I know I'm picky, and yes, I know I need to stir it because the fruit's on the bottom, but honestly, I'm just fine without it. I don't need that in my belly. 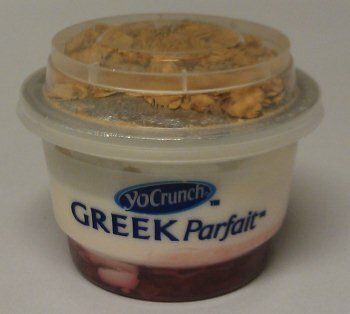 With that all said, I do have a soft spot in my hard for any yogurt company they tries to grab my attention with some extra crunch, and now, before my eyes for the first time, I see a Greek Yogurt that I just might like. And there would be my answer, Breyers yogurt is no more, that would explain why I haven't seen it in forever. That actually makes me said since I appreciated the "all natural" tag on their yogurts. Sweet, check this out! 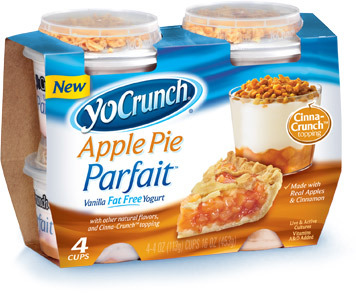 YoCrunch just announced a new line of Pie Parfaits! Apple, Cherry, and triple berry! I can't wait to try them! Ok, back to the treat on hand. Our tiny little 4 ounce friend is ready for snack. Why does yogurt photograph so poorly? This doesn't even make me remotely yogurt. Also, it smells tart which isn't helping. Overall the flavor is pretty good. On the first scoop I mixed in the granola before eating the treat, but on the second scoop I had just the yogurt and fruit to give it a try and it's not bad. I dig the fact that it's high in protein and very low in fat (the fat is from the granola ironically and not the yogurt). So now that I have joined the greek yogurt world, I guess I need to go try that greek frozen yogurt now that Rozilla liked. 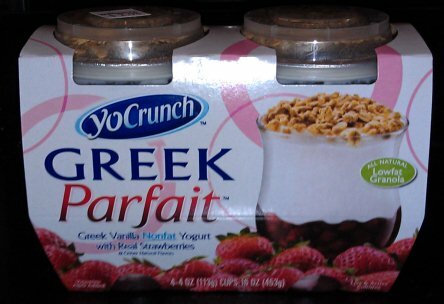 I'll also try the YoCrunch blueberry greek parfait at some point as well. This sounds a lot like the adventure that I'm putting myself through on my blog. I never liked Greek yogurt either (have always loved regular yogurt), but I'm putting myself through a Greek adventure as well with my countless reviews of Greek yogurt on there. I've found that if you have enough of it and get used to the taste, you might start liking it. That's what's happened to me. 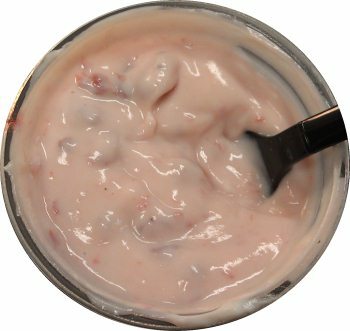 If you don't like your yogurt clumpy I'd go for the ones that are smooth and already blended up like dannon's light and fit or the yoplait kinds that aren't fruit on the bottom. I know I enjoy those way more than the kinds you need to stir. They have a way better consistency. Oh and did you see the whole new frozen greek yogurt line by ciao bella? Looks really good to me. really???? --- just checked their website and Adonia is coming in 2012, very cool. Seems to be a big trend that's catching on. I'm not sure if you have any hannafords around where you live but their "premium" house brand tastes of inspiration just added a line of frozen greek yogurt pints. I picked up a pint of the black raspberry kind so I'll have to report back on how it was. So I just tried the pint and I'm really blown away. I think that was the best black raspberry frozen dessert I've ever had. It was extremely creamy and reminded me of premium ice cream. The only thing I can fault it for is that it did melt a little quicker than expected but it was still delicious none the less. Oh and there was no seal on it which is always a bummer but no ice crystals so it's all good. If you ahve a hannaford by you I recommend you go give this one a shot. Nice! We do have hannafords in the general area (though the one closer is kinda small). I will definitely pick some up! I went on their site and saw the other flavors they have. They're vanilla, strawberry and then a blueberry pomegranate version I'm curious about. Oh and at $2 a pint it's a pretty great deal.